Titom theory was not forced to cross the Rubicon river finally. 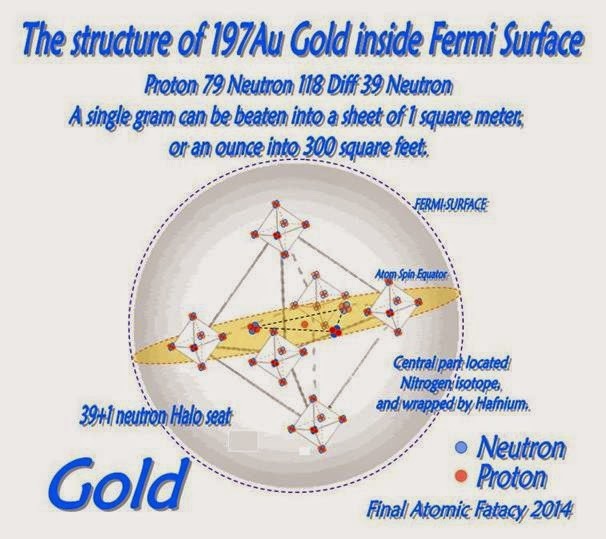 Thus, the reason is not something generated by nuclear fusion in the interior of the star, to the future, Gold, Lead, and Plutonium are also drawn in quantum spin style. The fission of small nuclides, laser nano size and high energy density of the United States NIF would be effective in the control of the interior nucleus as a manipulator to uranium-238. The laser light will be illuminated on the boundary line of Atom spin equator, with the exception of iron nuclei. fatacy's comment: I'm not sure that tetrahedral 4 neutrons will be neutron halo, I look forward to the work of younger human being's hello world. γ-ray + 4He → 2p+ + 2n, there could be a possibility that the reverse phenomenon of Big Bang theory inflation period. There are 28 of the magic number structure very similar to Iron atom, 56 is multiplied by 4 to 13, half of 56, half of 28, half of 14, 7 of Nitrogen just here I will be in atomic number stream. 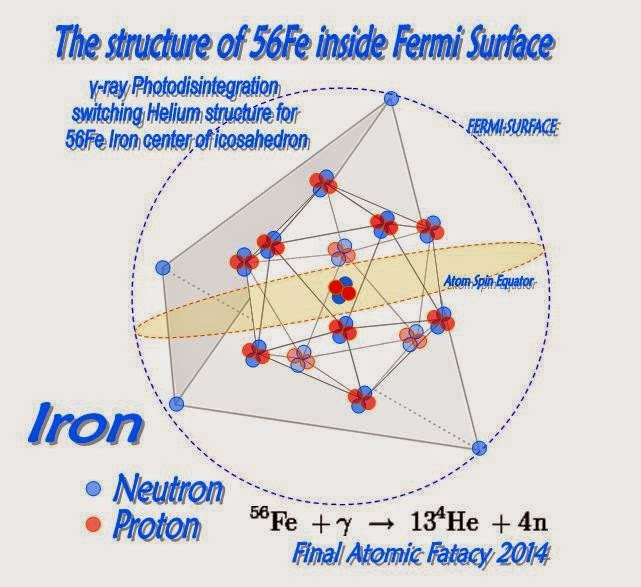 28 Half of 56th Iron atom, is Silicon atomic number. It is also the magic number of nucleus, 28 is the number of times the Nitrogen of atomic number 7. In the way of thinking the same as Iron atom, and try to draw a Silicon atom 28. 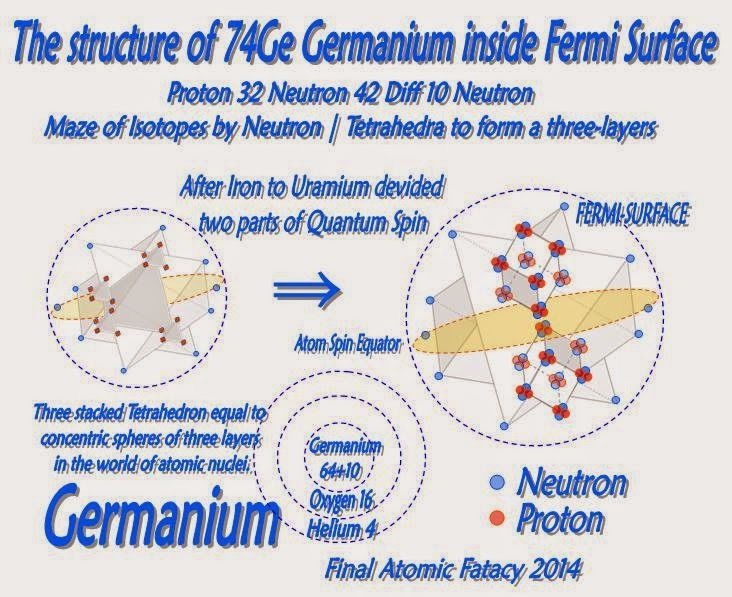 The audience understands its purpose, and want to draw an image of Nitrogen atomic nuclei, because it is an odd neutron number of atom 7 exceptionally together with 5 Beryllium. Because scientist human body may maintain less than 100 years. Summary pages through these experiments. Is a pair of Dual Torus able to connect another pair? So count on overlapped one there will be three Tetrahedron shaped. Try to show two Tetrahedrons and Intermediate substance(gluon) changes magnetic repels(rebound) to attracts same as premier experiment hexahedron. parts showed in video named "Dual Torus"
Helium Nucleus model shoved the power to rebound, electron and magnetics which represent Higgs gravity mechanism by 2 particles. Twitter argument wellcom, specially Higgs topics. You'll be able to inspire something from this Japanese page. In Saturn and Jupiter, both the size and the magnetic force of polar regions differ greatly, of course, the sun is the strongest in the stars around us. I told that when the axis number of the pipe axis is compounded, energy flows in a pipe shape, the example in this figure is the initial state. I can not find it unless I often search for it, but the fact that a helical torus fragment is photographed means that Jupiter's atmosphere moves up and down and it mixes well. Still another point, although some white spots like the center of the vortex can be seen, depending on the viewpoint, these can be regarded as the needle point of Space 5th-Urchin. 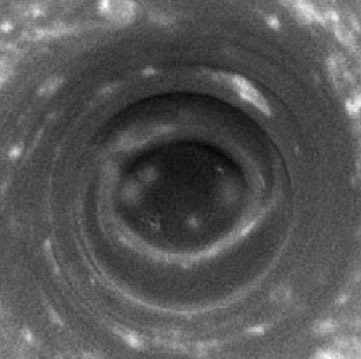 In Jupiter it is a phenomenon in both polar regions, but in the sun it seems that the center of such a vortex is scattered throughout the surface. The helical torus is a model often used in mathematics in which the secondary phase of the donut shape is further twisted. The torus can freely deform to the minimum or maximum in the gauge space, and furthermore paired while considering space symmetry is called a dual torus, in this case the two torus are point symmetric. 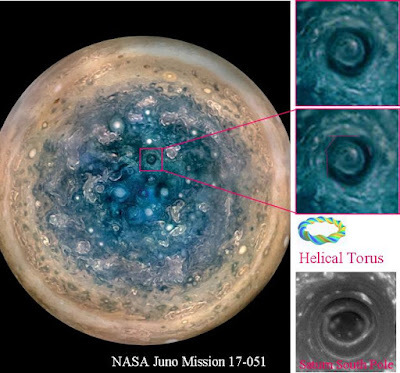 Well, it is an explanation that part of the twisted part which is similar to the helical torus appears to dig into the magnetic field lines from Jupiter's poles. In Jupiter size it does not seem to be an Alfvén wave twisted from N pole to S pole like the sun. 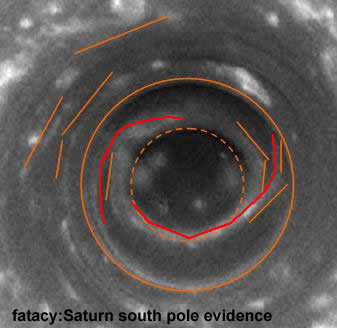 However, there seems to be a difference in the intensity of the magnetic force lines even in the N pole or the S pole, and the helical torus exemplified seems to be becoming a pipe shape. I will soon try to translate in English. For more detail explained in Japanese. Renew! After 2years interval. Blu-ray raw info. from Japan Direct. Market is automatically matured after 2 years interval. Japanese maker is switching player to recorder, soon rapid infomation is obtainable. 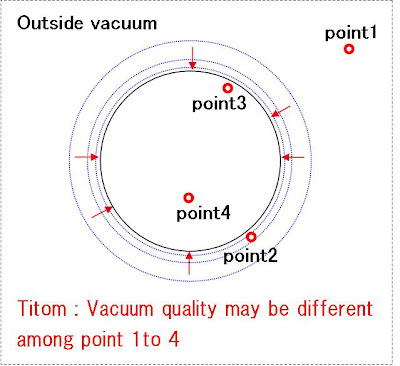 = Vacuum quality is different among each point 1 to 4. As a Titom theory, vacuum latch mechanism is different, around point 2 latching time needs longer and become FIFO memory, for the same reason the light speed is slower than point 1. = Vibration frequency also different between 1 and 2, to my point of view it hardly the vacuum is keeping same quality and expanding whole universe. = Vacuum liquidity or freedom of movement should participate to this space show. = Vacuum movement create stream and whirlpool, and hydrogen is shaped as a miniature whirlpool in space, which mentioned resonance phenomenon at previous page. == Our universe is consist from only vacuum. = This vacuum possessed two properties. 1 Instantaneous latch(sort of machinery ratchet) mechanism decided and kept time flow direction. - This latch mechanism is nearly FIFO memory system where instantaneous length changes at near event horizon. 2 The vibration of four bi-directions is conveyed. - From first to third bi-direction is corresponding color charge in Quantum Chromodynamics, last fourth bi-direction is corresponding gluon, could be. - This bi-direction can project spin value to outside. 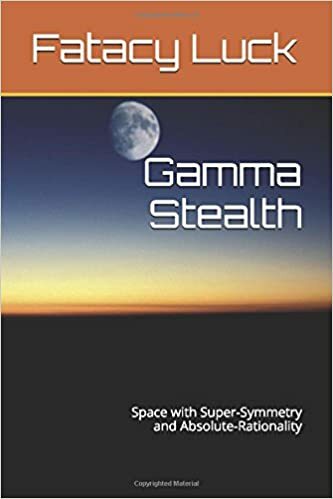 - I think this neutron star is not spin any more, it is bi-direction superfluidity phenomenon exposed, there is another fact that vacuum is supporting and being nutrition this pulsar. - Also, this pulsar is not material any more, it is the mass of vibration. Another word, the last moment and shape of energy (=substance) in our emission world. = Coulomb's force is generated by both properties from vacuum. - These latched vibration accumulated in nuclear shell and blackhole as electric potentials, and give an influence outside world electron and light. = Magnetic force is generated by nucleus Coulomb's force. - Essentially, this magnetic force and electric potentials are the same delivered from vibration, but only the difference 90 degree destiny. 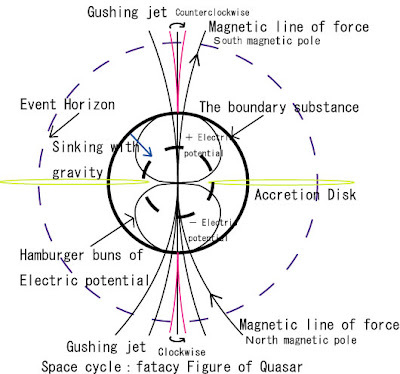 - Inside nuclear shell, the center of Hamburger buns electric potentials and magnetic dipole is located nearly, so K orbit electron is balanced two positions is stable outside nuclear shell. = Vacuum is wrapped and sealed up by resonance phenomenon caused from these four bi-direction vibrations. This was Hydrogen born. - One bi-direction vibration and latch repeats alternately, accumulated + and - electric potential(Hamburger buns shape) inside atomic nucleus, and outside K orbit electron forcible by outside vacuum. = This Hydrogen made the near side vacuum be warped. - This warped vacuum set "instantaneous latch mechanism" time a bit longer. - The vacuum try to make warped vacuum dissolution(vacuum dislike longer FIFO memory), this property generate gravity between each nuclear shells, even between man and the earth. = This warped vacuum grow to blackhole. - The whole history of universe generated so much collisions in herself. = Our vacuum is conveying both electro-magnetic wave and gravity. Both direction is kept by instantaneous length latch mechanism. 1 The electro-magnetic wave transmitted as a emission wave. 2 The gravity transmitted as a contraction wave. 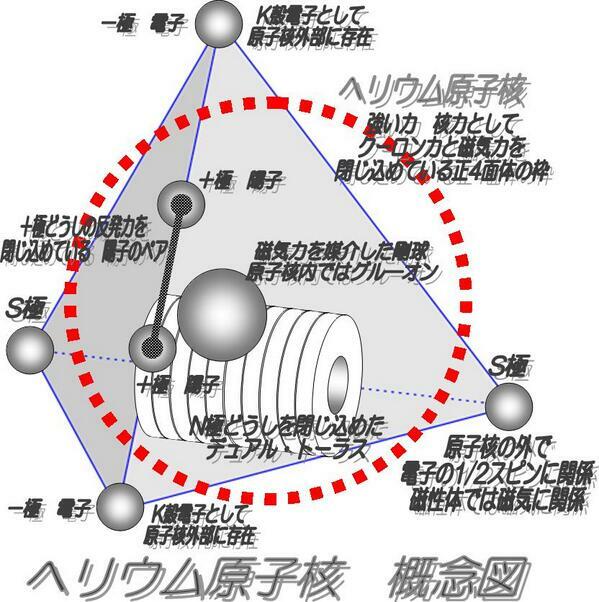 - Nuclear shell and event horizon equipped common character specially the behavior to electro-magnetic wave and gravity. = I am trying to explain about the space cycle from quark to quasar generated from vacuum. 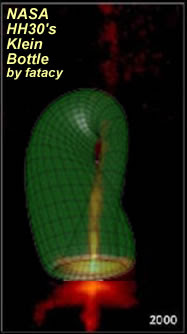 - "Space cycle ： fatacy Figure of Quasar" shows typical shape from nuclear shell to quasar, Saturn either. = Rare gas electron configuration and orbit mechanism. - These numbers can disassemble. - Inside atomic nucleus state projected outside electron orbit. - 10=6+2+2:Ne 6 is suggested apex number in octahedron(related to the existence of hexahedron 8 apex inside atomic nucleus). 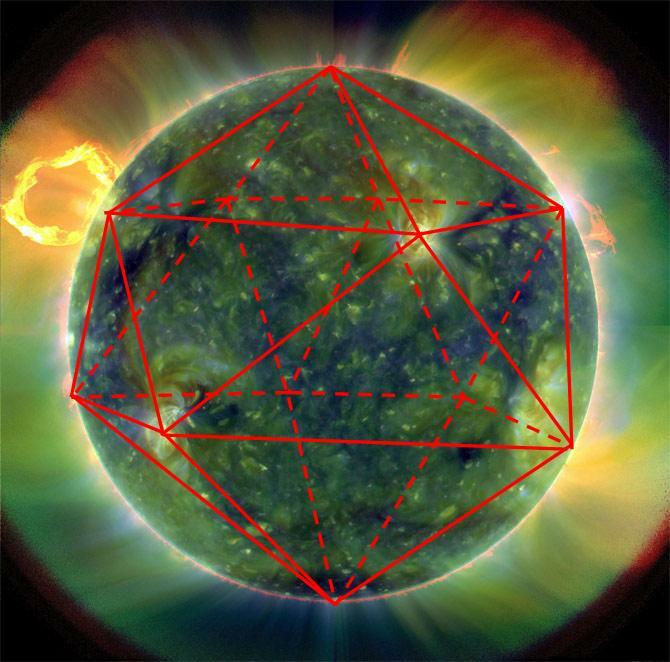 - 36=18+10+6+2:Kr 10+2 is suggested apex number in icosahedron(related to the existence of dodecahedron 20 apex inside atomic nucleus). - In our material world N orbit begins magnetic influence stronger like Fe, Ni etc. = How does it negotiate between inside and outside through the nuclear shell? - At first, Helium is basic existence 2+2 mechanism is special involved + - N S, this specification looks sometime 2, another time 4 in gravity structural operations, somehow strongly related K orbit 2 electrons. - Mysterious number exposed hexahedron 8 apex inside nuclear shell gives influence to outside apex number 6 octahedron. - As the similar mechanism, number exposed dodecahedron 20 apex inside nuclear shell gives influence to outside apex number 12 icosahedron. 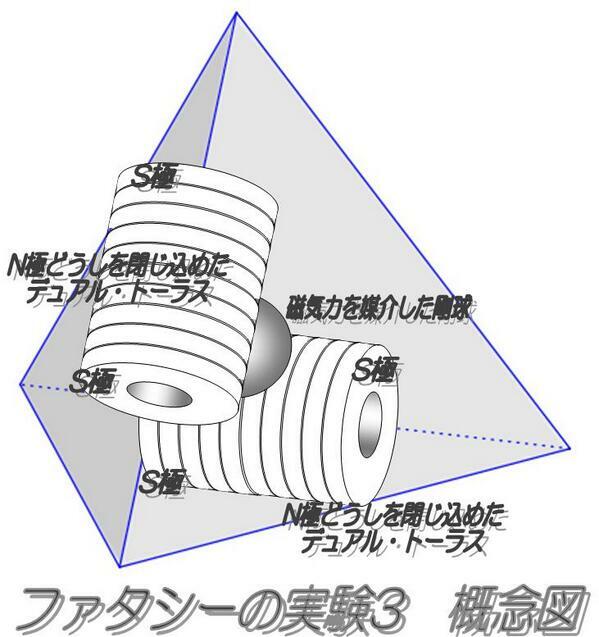 - These vibration closed polyhedron will cease from 3, 4, 5, to hexagon 6 inside nuclear shell. = To realize nucleus magic number 2, 8, 20, 28, 50, 82, 126. - 2:He is already explained as Helium like Phantom or Joker. - 8:O is hexahedron apex inside nuclear. - 20:Ca is dodecahedron apex inside nuclear. - 28:Ni is 20+8 disassembled. - 50:Sn is 20*2+8+2 disassembled. - 82:Pb(Proton) is 20*4+2 this number composed by proton only. - 126:Pb(Neutron) is 20*5+8*3+2 this number composed by neutron only. = Why is the different treatment with polyhedron between in and out? - The main reason is our vacuum equipped transmitting both emission wave and contraction wave. - There is an structure When the emission wave cross into nuclear shell, or event horizon convert to contraction wave. - As the outside contraction wave also can encounter and penetrate the conversional wall. - As the rational conclusion which is presumed these wave exchange wall makes the other side the time flow direction is retrograde. - Under this conversional wall, polyhedeon's apex number is commonly held the number of aspect. - From dodecahedron, hexahedron to tetrahedron can hold common apex in nuclear shell. - Specially, two patterns tetrahedron can be contained in hexahedron, each tetrahedrons get easier exchange their role + or -, N or S.
- This talented tetrahedron get the name as "Titom" using in nuclear shell. In the outside vacuum this Titom's character is more like space. - From inside Titom(nuclear tetrahedron to dodecahedron) to outside Titom(hexagon to icosahedron) exchange bi-directionaly, it is called The space cycle. = Interfacial tension is one of main universal force makes every existence sphere. 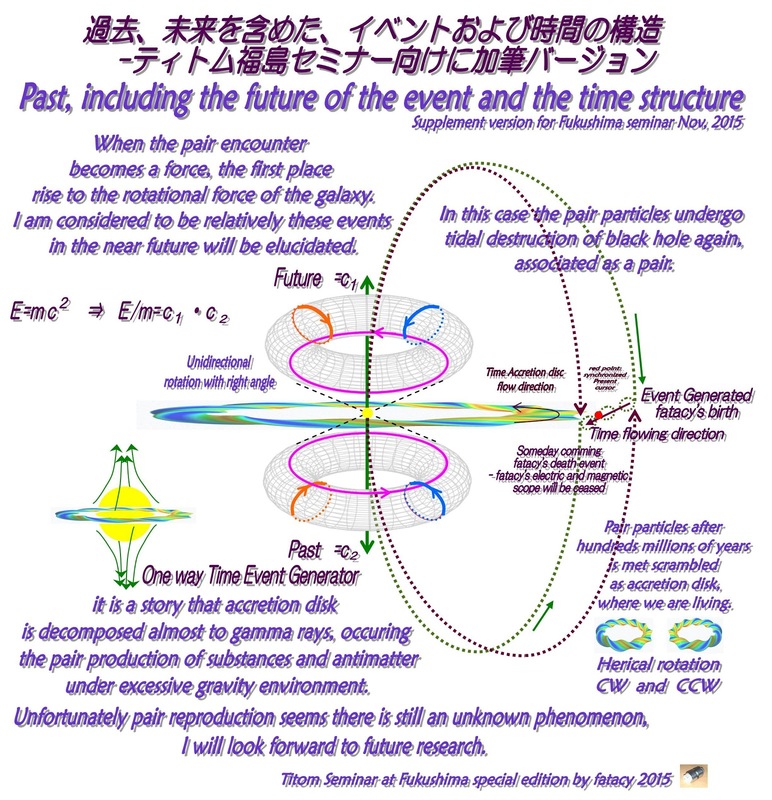 = Uncertainty principle will change certainty by proceeding 4 bi-direction vibration studies. = Regardless of closed area is small or huge, all existence in our space has belonged conversional wall, even in blackhole, in earth, in atom. and also belonged warped vacuum conveyed as gravity. = I will try to explain this formula (50:Sn is 50=20*2+8+2 disassembled) in detail. 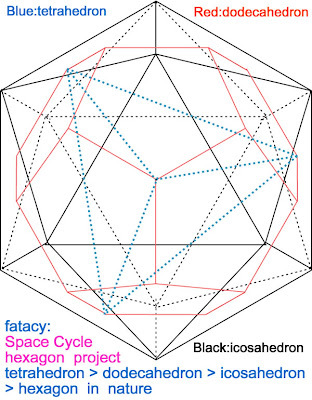 - 50=20*2+8+2 is more easier to understand 50=20+20+8+2, and then + means inclusive relation showed by "ball3" and "ball2" in fatacy's polyhedron figure. 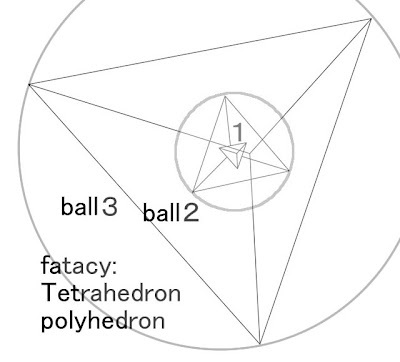 - Tetrahedron Helium is also held common apex among hexahedron, dodecahedron inscribed in "ball3" or "ball2" each stage. - In this case, only tetrahedron Helium relayed spatial route between "ball3" and "ball2" each stage. 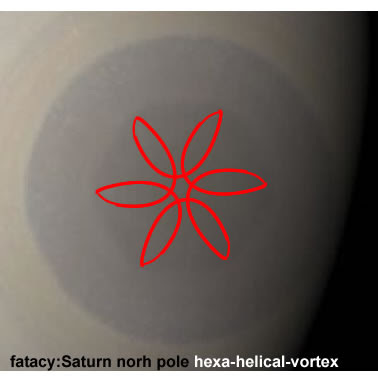 - Fatacy's polyhedron figure revealed pulsar (neutron star) inner structure I imaged, could you imagine there is only nucleus vibration built red hot star, and soon I hope, an evidence of absurd enormous neutron halo effects will be of its outer structure. 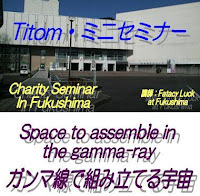 - Nucleus inner structure showed by fatacy's polyhedron figure, it appears anytime as a particle to the outside watcher (high energy particle physics), as for actually form when you go inside nucleus shell there is vibration structure and resonance point which polyhedron apex around. = Latched vacuum included law of the conservation of energy, theory of Titom included also material and gravity mechanically with Goddess bi-direction vibration. = When you are walking and steps ahead, each motions supported by latched vacuum. And this vacuum produced tiny bubble Hydrogen, after enormous time flowed and collided extremely it grew galaxy, and meta-galaxy structure (still bubble structure of dark matter), vacuum is maintaining her memory. = If you could read Japanese, visit this site mentioned about structure of meta-galaxy, singularity, quark, and lots more minute stories you can touch. I hope your attendance beside by my Noah's cabin seat, could be so nice. Net client side expliments will be continued.